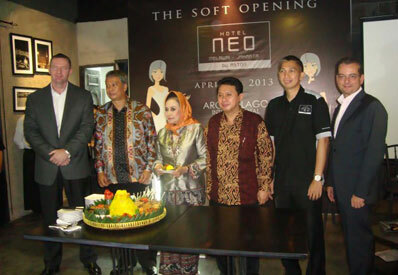 Jakarta, April 30th, 2013 - After recently having inaugurated Hotel NEO in Asia with the opening of the Hotel NEO Cideng – Jakarta and the Hotel NEO Legian - Bali, Archipelago International has now unveiled its third NEO in Indonesia and the second in Jakarta - the Hotel NEO Melawai.. 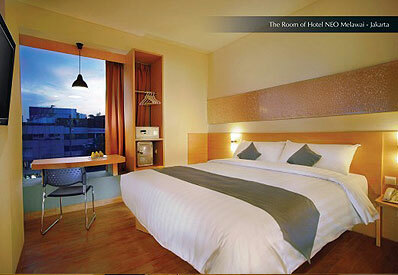 The new NEO sits on the corner of Jalan Panglima Polim and Jalan Melawai in the heart of Jakarta’s Blok M entertainment and shopping area and offers 88 modern and stylish guest rooms, is designated as a non smoking hotel and aims to present stimulating interiors without the high price tag usually associated with designer hotels. Catering to travelers who appreciate modernity and the creature comforts of modern business hotels the new NEO property features a full set of in room amenities and up market facilities such as mini-bars, café makers, vanity mirrors and top of the line beddings and linens while maintaining its credo that well deigned Hotels that make sense and work well do not need to be expensive. "Since creating the Hotel NEO concept in 2011 and the recent openings of the first NEOs in Cideng-Jakarta and Legian-Bali we have been particularly excited to bring the “NEO style” to Blok M. This is an upcoming neighborhood which up to date is deprived of modern and stylish hotels. Blok M is hip, happening and bohemian and as such NEO is a perfect match. Our next NEO will also open in Jakarta in Mangga Dua and then be followed by several more in Bali including such great localities as Seminyak, Kuta Center and Petitenget," said Norbert Vas, Archipelago International’s VP Sales & Marketing. Snapshoot Soft Opening Hotel Neo Melawai, seen in the image rice cone cutting by Mr. Jade Illy Bunny – President Director of PT. ISIHOMBING also as owner of Hotel NEO Melawai & Ms. Melani Leimena Suharli – Vice Chairman of People's Consultative Assembly RI as an official sign of Hotel Neo Melawai’s opening witnessed by (right to left) Mr. Norbert Vas – Vice President of Sales & Marketing Archipelago International, Mr. Aldrin Siagian - Hotel Manager Hotel NEO Melawai, Mr. Drs. Agus Priyono, MM – Director of Tourism Industry and Mr. John Flood - President & CEO of Archipelago International.